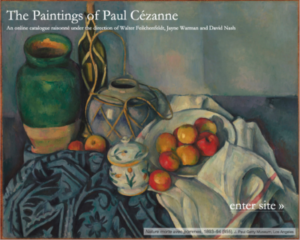 The south and the north are two centers of Cézanne’s work, the former being the country of his birth and maturation, the latter the center of France’s art world, where Cézanne studied and met other young painters who would become his close friends. From early on, he divided his time between the two cities; his landscape painting was done in the vicinity of one or the other and only very rarely elsewhere. In the north Cézanne painted outdoors in a region extending roughly from Pontoise (30 km northwest of Paris), Chantilly (50 km north of Paris) to Fontainebleau (69 km to the south); and in his native south (le Midi) he worked in a smaller region extending from Aix-en-Provence eastwards to Le Tholonet, at 11 km) and to the south (L’Estaque, on the Bay of Marseille, at 20 km). These are in every sense the poles of his work, being separated by physical distance (roughly 750 km between Aix-en-Provence and Paris) and by culture (Aix-en-Provence as the historical center of its own, Provençal culture). The two regions differ in their geography and – for a landscapist – above all by their light; we call attention to their difference by listing them separately. The Midi landscapes have an abundance of yellow in the summer, the roofs of the houses are the color of terra cotta, and their skies are a warm blue. The country in the North is a cooler green, with roofs a grey slate and the skies a silvery blue. Cézanne naturally records these differences, as fine as they may appear: in his landscapes, no matter how structured his composition and systematic his touch, there is a record of his acute observation. There is, however, a subtle difference in his reponse to the lansdcapes of the south and the north. Cezanne reveals it in the occasional reference in his letters to his native south, where he talks of the “treasures of …this country”, but it is also visible in his paintings. He is quite passionate and visibly attached to its appearance, but in the north we sense a somewhat more detached, analytic attitude. There is no question of the quality of the paintings; both regions have produced their masterpieces. Nor is it a question of the warmer tonality of the one and the cooller tonality of the other, which are simple reflections of the way they appear. It is, rather, that in the north, his more analytical attitude toward the landscapes seems to have led toward the development of abstract touches of paint sooner than in the south, as if in the south his attachment to the countryside was deeper and more sensual, and remained closer in appearance to his sites. We might take as examples the unique L’Étang des Sœurs à Osny, près de Pontoise (R307–FWN106 of 1877), a landscape which was a very early precursor of his later styles; the sequence of paintings culminating with the abstract L’Allée à Chantilly III (R614–FWN246 of 1888); and the pioneering Giverny (R778–FWN300 of 1894), in which the late large, flat patches of color first appear. All these were painted in the north; in the south, the late, more abstract style (so admired by the Cubists) appeared only later. By grouping the landscapes by their two regions of origin we wish to call attention to Cézanne’s great sensitivity to his motifs, and to suggest that the sensitivity was the source of the innovations in painting that influenced later painters so profoundly.